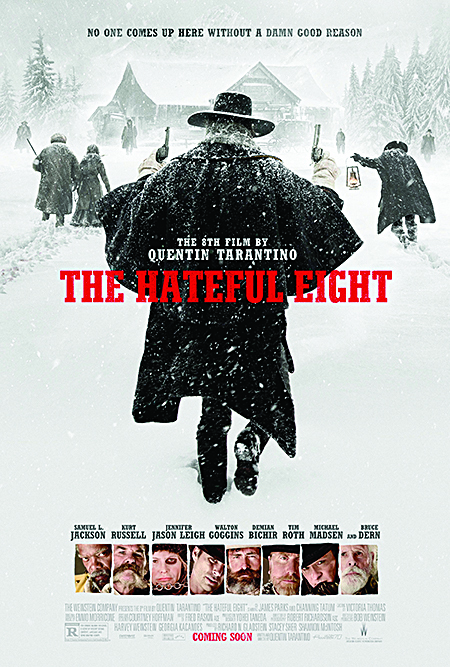 The Hateful Eight is a new Western movie and ironically enough, the eighth film written and directed by Quentin Tarantino. For the record, I viewed this film in the general release digital format, but there is a roadshow (70mm) format available in certain theaters across the country. That version runs twenty minutes longer, including a few alternate scenes as well as a full overture and intermission. Although his work is quite controversial, there is no denying that Quentin Tarantino is one of the most talented directors working in Hollywood today. Personally I am a huge fan of his films, from classics like Reservoir Dogs and Pulp Fiction to modern masterpieces Inglorious Basterds and Django Unchained. I couldn't wait to see what he was going to bring us with this next project. Nobody in Hollywood writes a script better than Quentin Tarantino and it is on full display yet again in this next masterpiece. His longest movie to date, The Hateful Eight is powered by its intriguing story and incredible dialogue that never loses your interest. Everybody in the cast had amazing performances, including Tarantino favorites Samuel L Jackson, Tim Roth and Michael Madsen. Furthermore, Ennio Morricone (The Good, The Bad and The Ugly) delivers his first complete western score in forty years and it sounds absolutely incredible. That contributes to the old-fashioned style of this movie, which I absolutely loved to see. Of course, Tarantino brings plenty of his signature humor to this film, as well as tons of absurd, over the top violence. Keep in mind the time period of this piece, so there is certainly some extreme content that could be found offensive. However, if that doesn't bother you and you are a fan of Quentin Tarantino’s work, this film is easily worth seeing in theaters; it is one of his absolute best projects to date.